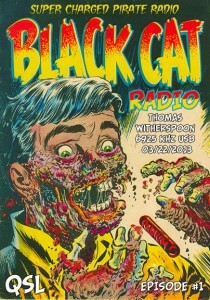 Last night, I heard a new pirate on the air: Black Cat Radio. Black Cat signed on 6,925 kHz USB around 23:45 UTC. After sending in a reception report, I received a reply with a cool eQSL card (see right) and learned that this was, in fact, show number one.